The history of Local 267 started when many of its charter members organized The Syracuse Union of Journeyman Plumbers and Steamfitters Local 59 in 1889 in the Independent Association, or the I.A. as it was known. The United Association of Journeyman Plumbers and Steamfitters of the United States and Canada was organized October 11, 1889, and Local 59 withdrew from the I.A. and petitioned for, and was granted, a charter from the United Association as Journeyman Plumbers, Gas, and Steamfitters and Steamfitters Helpers Local 40 in June 1901. Due to a dispute between Local 40 and the Syracuse Trades and Labor Assembly, which also unfortunately involved the U.A., the charter of Local 40 was revoked by the U.A. in May 1902. During this stormy period, Local 40 continued to function as an independent union until a few of the tradesmen petitioned for a new charter from the U.A. and were organized as Plumbers and Steamfitters Local 374 in February 1904. This charter existed until September 2, 1905 when the remaining members of Local 40 and the men of Local 374 reunited and were granted a charter recognizing them as Plumbers, Gasfitters and Steamfitters Local 54 Syracuse. 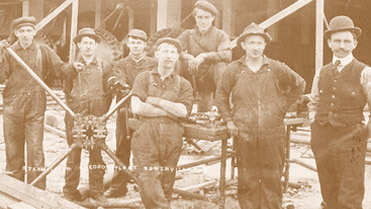 Local 54 continued as a combination Plumbers and Steamfitters Local until June 1920, when the Steamfitters petitioned for and were granted a charter from the U.A. as Steamfitters and Steamfitter Helpers Local 818, Syracuse. The charter of Local 54 was changed to Plumbers and Gasfitters. Local 109 Ithaca was granted its charter in 1893 and grew through the years as a result of mergers with local unions throughout the area. Mergers with Local 707 Cortland in 1959, Local 206 Elmira in 1961 and Local 462 Corning in 1972 enlarged both the geographical jurisdiction and membership of the Ithaca Local. In 1987, Locals 54, 818 and 109 merged and were chartered into Local 267 as we know it today. With a continued dedication to the principles of our founders-Education, Organization and Union Brotherhood, Local 267 will continue to seek a better life for its members and their families by constantly striving to improve our wages, conditions and fringe benefits. Looking back with pride to our past we also look forward with confidence to a strong future in the Twenty-First Century.